Sprawled along numerous small gardens, parks and cafes, Sofia has become an inviting beacon for travellers around the world in the last few years. However, if you think that it is similar to every other capital - busy, noisy and overpopulated - you couldn’t be further from the truth. For this very reason Sofia remains, to this day, so close to my heart. Noisy it is, overcrowded possibly - but there is a lot more that this Balkan jewel, tucked away in a valley of the Vitosha Mountain, offers millions of visitors annually. Whether it is the art, history, music or food that attracts you here, it’s hard to imagine that you could leave this magical place feeling cheated. I recently spent ten days in my native Sofia and I am now bubbling away with excitement to share my wonderful experiences with you. I promise this won’t be your classical guided tour article written in a few paragraphs; rather I will just give you some of my recommended tips, as a local Sofian, of how to rediscover the beauty of Bulgaria’s capital and largest city. 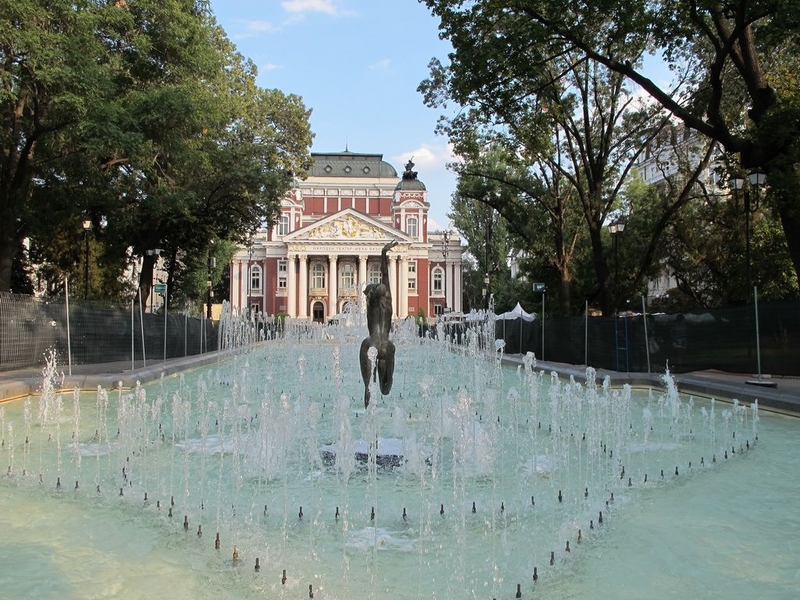 First off, one of the must-see places that everyone travelling to Sofia should visit is the National Palace of Culture. This iconic building, erected during Bulgaria’s socialist era of the early 1980s, is an absolute landmark which kicks off my journey. It’s not just because of this, however, that I’d like to share this with you but rather that it is right in the heart of the city centre and also because it has a lot more to offer than flower paths and fountains. I have never been a fan of the ordinary which is why I think that after seeing this impressive black & white building, you should pick one of the little paths that will lead you to the small gardens, benches and cute little cafes that this area has to offer. There is some kind of a subtle romance in doing that as you will be able to truly feel the spirit of Sofia. Walk around, take a rest on a park bench, watch the people stroll past and the kids that usually skateboard around the Cultural Palace’s grounds with their friends. After taking the load off your feet, have a wander along the main flower paths that are in front of the National Palace of Culture. Then if you haven’t been to Sofia’s main boulevard, Vitosha, at the end of the square, a bit on the left, cross the traffic lights and just go straight. This is it – Vitosha Boulevard, a pedestrian walkway full of nice shops and various bars and restaurants to suit every taste. Instead of going along the boulevard though, just pick a side and start discovering the little streets that cross Vitosha. If I were you, I would pick the right side as there is an abundance of art shops and small restaurants where you can experience the beauty of the hand-made jewellery or the home-made traditional Bulgarian dishes. Walk further along the streets and go into the shops, you will be surprised by the variety of things and trinkets that these places have to offer. If you are more of a planner though and if you don’t like getting lost, then I suggest you just stick to Angel Kunchev Street. Go along and just enjoy the atmosphere. Then turn right at Solunska Street and walk for about 2-3 minutes to experience the idyllic feeling of the crowds that pass the outdoor bookstalls of Slaveikov Square. Take a right and we’ll continue our little walk in order to visit even more intriguing places. Cross the lights and stroll along Graf Ignatiev Street where on the left you will see a fruit market, as well as Sveti Sedmochislenitsi Church and its garden. Try some of the luscious fruits and vegetables that the old ladies will offer you. Some of them are even grown in the merchants’ own gardens which might make this experience even more authentic for you – it’s a truly organic feast for the eyes as well as the taste. 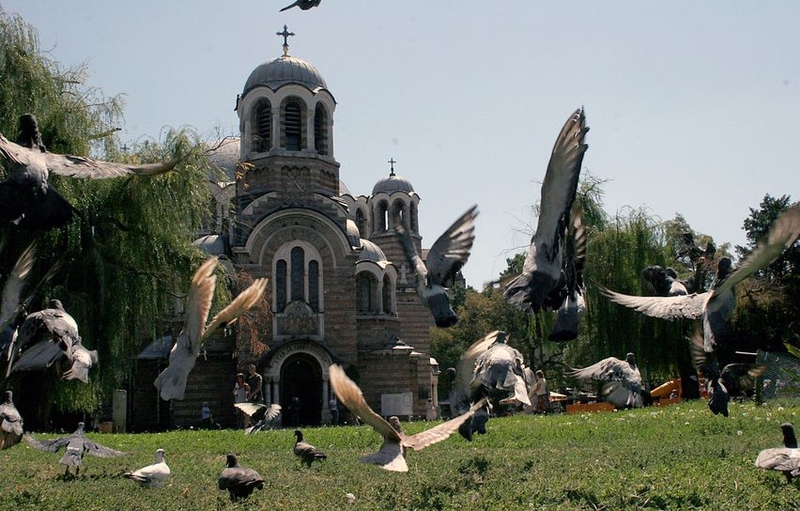 Grab a few nectarines and sit in the garden of Sveti Sedmochislenitsi Church. 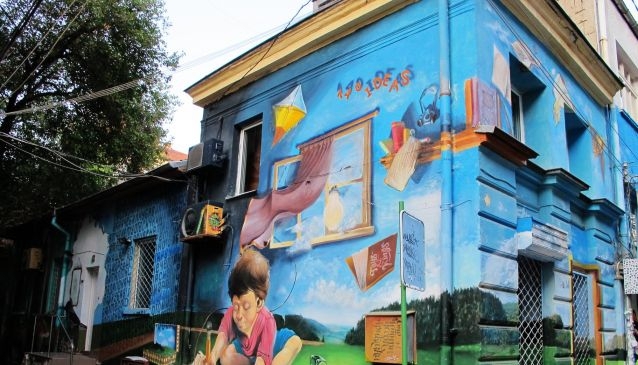 Enjoy the moment for a bit and when you feel relaxed enough to experience some more of the artsy restaurants, cafes and shops, walk through the garden and find Tsar Ivan Shishman Street. Tsar Ivan Shishman Street (or just Shishman as everyone calls it) is one of the most iconic small streets in Sofia. 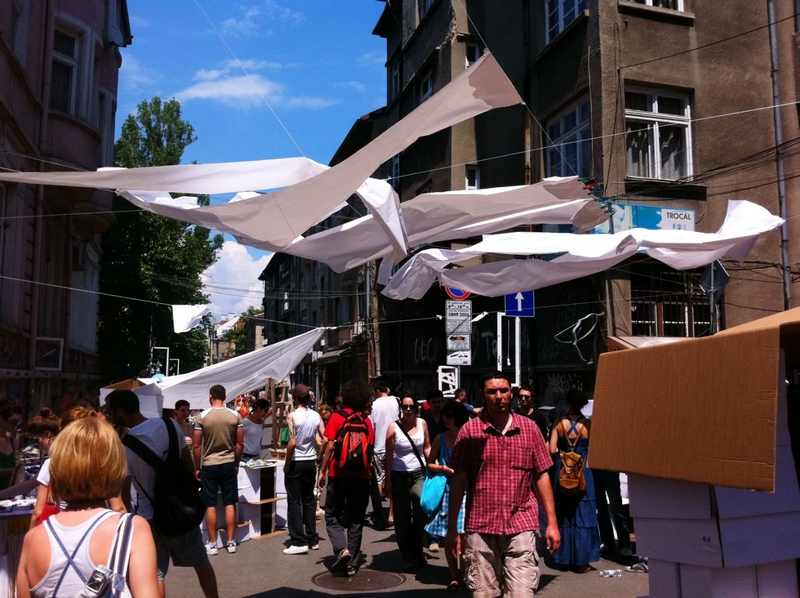 In the last few years it has hosted a number of highly publicised creative campaigns such as “Sofia Design Week” as well the capital’s trendiest cultural event – “Sofia Breathes”, when the organisers turn the street into a walkway of art, music and endless partying, bringing lovers of art and creativity together. This usually happens in early August when it’s hot enough for people to go mad (in a good way, of course). However, even if you decide to come in September, for instance, you will still be able to enjoy the paintings on the buildings or the small cafes tucked away in the gardens of the restaurants. Whether it’s vintage shopping, drinking cocktails or enjoying a mouth-watering Bulgarian dish, this is the street to visit. Come to the end of the street and when you feel like you have reached a circus carpeted with yellow paving blocks, you will realize that you have reached another key landmark. This is the monument of Tsar Alexander II that stands across from the Parliament building. Even though the square is truly impressive on its own, I suspect that you will be quite distracted by the golden domes of Alexander Nevsky Church that can be seen just behind the Parliament. Many of the tourists and even natives dare say that this is the most beautiful and striking landmark of Sofia. I guess that they must be right because if you sit outside on a bench and if you just stay and look at it you will really be able to feel the powerful energy that it expels through it cupolas. You should definitely go inside as well if only for the frescoes and biblical scenes which are unequivocally breath-taking. After Alexander Nevsky, take a left and you will be able to enjoy the beauty of the oldest street market in Sofia. There you will be able to buy some of the most ancient jewelry, precious stones and icons ever found in the lands of Bulgaria. Many of the items have a rich historical background so don’t hesitate to ask, try or buy – it will be worth it. If you aren’t too tired yet I would suggest another 15-30 minute walk where we come to the end of our story. Take a left and then cross to the right. In front of you, you will see the Russian Church, as Bulgarians usually call it, or Saint Nicolas Church. It is a very small church built on a tiny hill, but you cannot miss it. Go inside and take pictures but don’t take too long as we have a few other places to visit. 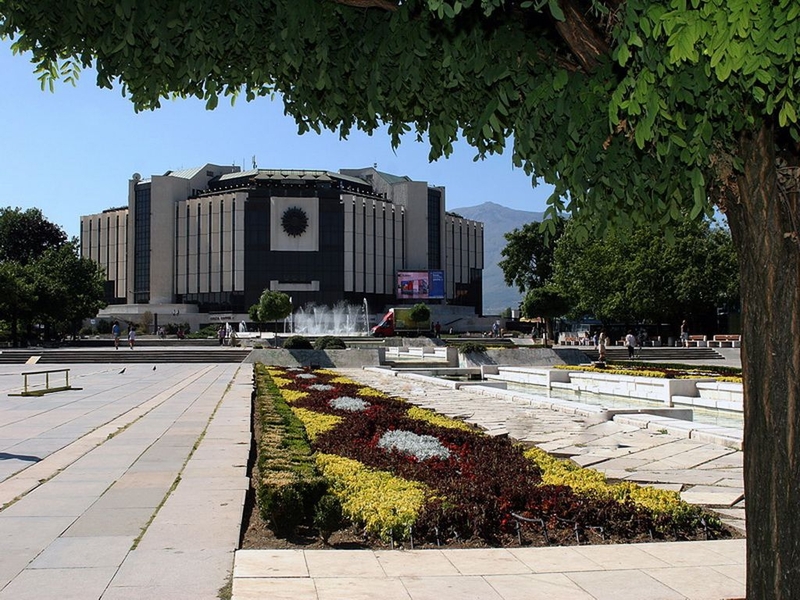 As you go along on to your right you will see the National Art Gallery and on your left you will be able to enjoy the lively gardens of Ivan Vazov Theatre. Depending on your mood, you can either sit and have a drink in the small park or cross to the centre of town where our little tour for the day will end with the sublime statue of Sveta Sofia that happens to be the symbol of my beloved city… Sofia.